Fantastic Four #200 was, no surprise, a big anniversary type special issue. 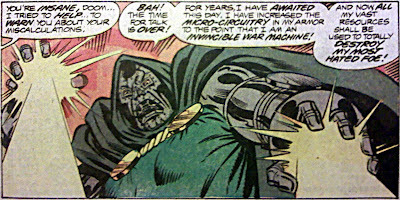 The FF had broken up after Reed became powerless, and Dr. Doom took advantage of that to try to create a clone of himself with the FF's powers amid a coup d'état led by the (allegedly) legitimate heir to Latveria. I'm sure readers at the time were expecting something big (I hadn't started reading the book yet myself) and boy, did the creative team deliver. Marv Wolfman and Keith Pollard had picked up the reins less than a year earlier, after Len Wein and George Pérez's well-received stint on the book. The book also sported a cover by Jack Kirby himself, which turned out to be the last time the man who created the characters worked on the book. The story opens with Doom cradling his dead clone, whom he was forced to kill in the previous issue. The story starts racing by and readers are treated to seeing the FF tackle death traps, heat-seeking missiles, a mind-controlled mob, a tornado, killer robots... On top of which, we see a recap of Doom's origin, Alicia Masters getting rescued, Zorba successfully leading the coup, plus an epic man-to-man fight between Doom and Reed. THAT is professional comic storytelling, people. Oh, man. This was one of the first, and possibly the first (I wish I could remember for sure) issues of Fantastic Four I ever read. Of course, it would have been more than a dozen years (only a dozen???) after it was first published, but it still packed a punch. This issue, and the whole storyline when I finally acquired it years later, killed it. Your post actually reminded me: my copy now has the signatures of both Marv and Keith. That has to be among my greatest signature-acquisitions. Though, the amazing thing is, this comic was so great that there are still at least two highly-desirable signatures one could wish for: Kirby himself (too late) and Joe Sinnott (whose work, I think, meshed as powerfully with Pollard's as it has with anyone's, and that's saying a lot). Probably a big part of why I've always enjoyed Dr. Doom, as well. Admittedly he's a great character from the outset, and fwiw I don't think this story was the subtlest characterization... but the passion of the character was incredible. I'm not sure anyone has surpassed this story, on that score. Subtle characterization? Hardly, but given that the whole story ends up with him going insane, it still works. Definitely Doom in one of, if not his single, most impassioned stories. Interestingly, my first Doom story was either FF #247 or #258, both of which pick up on the events of #200. Also very powerful, but in a decidedly more reserved manner for Doom. Funny you should mention signatures, too. My copy is also signed by both Wolfman and Pollard, and while I was writing the post, I was thinking how awesome it would've been if I could've gotten Kirby's sig on it too. I remember this issue as it marks the spot where I 'jumped off' comics for the first time, not returning to until issue 500. Did I miss anything?